Bought this hat for sun coverage under helmet and from the bill (bit of shade on my face). What I learned after riding a century this weekend, is this thing is amazing at channeling sweat away from your face and out to the bill of the cap, where it drips off harmlessly. 102 miles in 80 degree weather, and I literally had one, single drop of water drip into my eye...all day! I was skeptical when it arrived as the material doesn't seem absorbent and resembles a really nice shower cap, but with lots of perforations for ventilation. Ultimately it fit well under my helmet and was very comfortable. The bill also snaps up and down pretty solidly so you can pop it up on descents and drop it back down when you want. Came back to see if I could get another in white, but seems black with reflective letters is the only choice. This cap runs small. 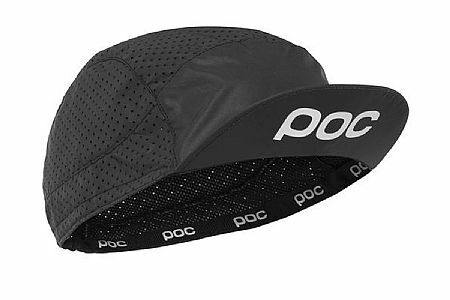 Any POC cap Made in China seems to be on the smaller side, I have tried 2. The third POC cap I have tried is from Italy and fits great. The material and construction seems nice. If you have a small head I would try it out.